A cornelius keg (also known as a Corney or soda keg) is a stainless steel canister (keg) originally used as containers by the soft drink industry. They can be used to store and dispense homemade sodas and home brewed beer. Cornelius kegs were originally made by Cornelius, Inc. In the keg, fully made soda is stored under pressure just like standard cans and bottles. The soda is referred to as "pre-mix" in the industry, as compared to Bag-In-Box (BIB) packages which are concentrated syrup. BIB soda is cheaper but requires a high quality water source and well calibrated dispenser. Pre-mix soda costs more and takes up more space, but can be used anywhere, and the equipment is simpler and cheaper. Pin lock and ball lock quick-connect fittings, which mate to the keg ports. Hoses attach to the threaded flare fittings seen at the top. The color of the plastic signifies whether the line contains gas (grey) versus liquid (black); these specimens are both for liquid lines. A cornelius keg is a stainless steel cylinder which can hold a maximum of 130 PSI. There are three openings in the keg: a large central hole which, by its design, can only be opened when the keg is not pressurized, and two ports with integral poppet valves which open when a hose with an appropriate fitting is attached to them. The central opening is used for filling and cleaning the keg, and is large enough to permit reaching inside for hand scrubbing. The two ports are used to dispense the beverage, one for "gas in", and the other for "liquid out". The separate metal lid for the central opening provides a clamp mechanism that closes and seals the lid against the keg with a large rubber O-ring. 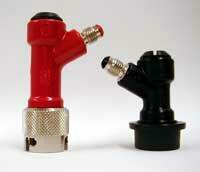 The lid also provides a pressure relief valve that is typically identified by a circular pull-ring (like a key ring). The relief valve can be manually opened to release the pressure in the keg; in the event of an unsafe overpressure in the keg, the relief valve automatically opens to avoid the hazard of bursting the cylinder. Two metal tubes are attached to the ports on the inside of the keg. The "gas in" port has a short tube, not reaching the fluid. The "liquid out" port has a long tube (a "dip tube") which reaches to the bottom of the keg. Headspace gas pressure (usually carbon dioxide and sometimes nitrogen forced into the "gas in" port) pushes the drink from the bottom of the keg, up the tube, and then out of the "liquid out" port connected to a tap or other dispensing device. The quick-connector fittings which allow hoses to be easily attached and removed from the ports come in two mechanical varieties, namely pin lock and ball lock, which are not interchangeable. Historically, pin lock kegs were used primarily by the Coca-Cola company, while ball lock kegs were used primarily by Pepsi. On a pin lock keg, there are metal posts (pins) extending horizontally from around the port. When the connector is attached, these pins hold it in place. The "gas in" port has two pins, while the "liquid out" has three, making it impossible to accidentally switch the gas-versus-liquid hoses (which would harmlessly result in carbon dioxide bubbling up through the drink, while gas but no drink would be dispensed). Ball lock kegs have ridges in the ports, which are gripped by small metal balls in the connectors. Both types of kegs are fairly easy to find, though ball-lock seem to be more common. As a result of demand from home brewers, second hand kegs are becoming progressively more scarce and in recent years brand new kegs have come onto the market, manufactured in China to the same specifications. Surplus cornelius kegs which are obsolete from the soft-drink industry have been adopted by home brewers as an efficient alternative to bottling, as the kegs are easier to fill, clean and maintain than industry-standard beer kegs. They are one of the most versatile systems for the home-brewer. In addition to this, most home brewers must bottle their beer by hand, which is a tedious chore for a large batch held in a single keg fill. The most common size of Cornelius keg holds five US gallons (19 l) which conveniently matches the size of a typical batch of home brewed beer. This means that rather than saving, cleaning, and filling approximately fifty bottles, the brewer only needs to fill one keg. Despite the simplified bottling procedure, refrigerating kegged beer generally requires a kegerator, which can be difficult to set up and maintain, for dispensing. Furthermore, individual bottles have superior portability when compared to a cornelius keg. Ball lock type quick disconnects seem to be the most popular way to connect both gas and liquid lines to the Cornelius keg for home brew dispensing. A typical beer line to control foaming has a 3/16th internal diameter giving it a resistance of 2 psi per foot. It is common to serve at pressures between 9 and 11 PSI. Wikimedia Commons has media related to Homebrewing. ^ a b c Papazian, Charlie (2014). The Complete Joy of Homebrewing. United States of America: HarperCollins. p. 408. ISBN 978-0-06-221575-8. This page was last edited on 15 August 2018, at 18:00 (UTC).